Barrows is one of the most popular minigames in Old School and this week we are showing it some love with a couple of new, highly requested features. We've also got a small addition to the God Wars Dungeon that will help you see through the pesky darkness of Zamorak's evil. A few new features have been added to Barrows to make your tunnel raiding that bit more enjoyable. In addition to the usual kill count, a check list now appears that will show which of the Barrows brothers you have killed. This addition will make keeping track of your Barrows progress an absolute breeze. It's visible while you're outside digging on the mounds too. 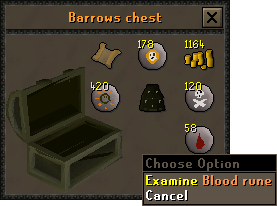 We've also added a reward interface that will appear when opening the Barrows loot chest. This will allow you to easily see exactly what your reward is. This interface will pop up right as you open the chest. For a few seconds after it appears monsters won't attack you, giving you plenty of time to admire your loot. As soon as you close it or walk away, the items will move to your inventory. The evil that falls over the Zamorakian area of the God Wars Dungeon taunts many of the adventurers that brave the icy battlefield. Only those who have let in the light of Saradomin can see through the darkness it causes. Saradomin's light is a new, tradeable drop from Commander Zilyana that, when consumed, permanently removes the darkness from the Zamorakian section of the God Wars Dungeon. If you manage to get your hands on a Saradomin's light you will be able to brighten up your trips to take on K'ril forever. Farming shops now stock packs of plant pots, baskets and sacks for your convenience. Players who click out of the dialog by accident when being offered a Jad slayer task now have 1 minute where they can talk to the master and be re-offered this choice. Bill Teach now has a much less chatty way of travelling – via a right click travel button! Leprechauns have improved their magic storing abilities and can now hold up-to a whopping 255 buckets. The Drill Demon random event exercise actions are now available as emotes – next time you're approached by Sergeant Damian, go and complete his random event to unlock them. Doors in Player-owned-Houses can now only be closed by the host. They can still be opened by everyone however. Some small changes have been made to a number of items due to problems caused by their models' polygon count, specifically the Dragon Cane, the upgraded Steam Battlestaffs, the upgraded Odium and Malediction Wards, as well as the new Eternal, Pegasian and Primordial Boots. Fixed a typo in the Hellpup’s dialogue. Ammo is now returned at the Duel Arena more reliably if you lose the duel. The Buy-All Planks button for regular logs now converts all your logs into planks rather than just one. Pegasian boots now have their wings on the female model too. The trade option on Lily in the Warrior's guild now opens the shop interface instantly as it should. The roof of the anvil building in Varrock no longer turns transparent when in the upstairs of the bank nearby. Added a game message stating why the Rod of Ivandis special attack may not have activated. A missing tile in Ape Atoll was filled in. The Abyssal Tentacle will now no longer lose charges on a free to play world. Mod Krista has returned to her work on the RuneScape 3 team. We would like to say a big thank you to Mod Krista for the help she has provided over the last few months. Later on this week we will be answering all of your questions about sailing! Join us for a reddit AMA and Twitter Q&A at 4pm BST on Friday. If you have questions about sailing we want to answer them! We will also be hosting a live sailing Q&A at 6pm BST on Sunday over on the RuneScape Twitch channel. Make sure to be there to have all of your sailing questions answered live! So ready for the barrows update! Zamorak just became weaker :/ I'm playing osrs for fun. I want more stuff made that helps improve the quality of the game. -Don't forget all problemes can be solved but it will always come new ones.